Balanced Team Ann Arbor Has Kicked Off! A brand new chapter of Balanced Team just got started in Ann Arbor, Michigan. 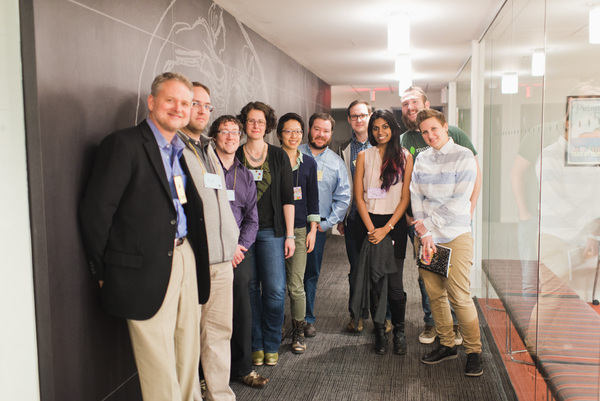 Our first meeting took place on March 30, 2016 at the recently renovated ITHAKA/JSTOR offices in downtown Ann Arbor. We had a small but engaged and very diverse group, which was the perfect way to kick off the chapter. There was a mix of people who had been to BT events before and those brand new to the idea, people involved in product development and people who are not. 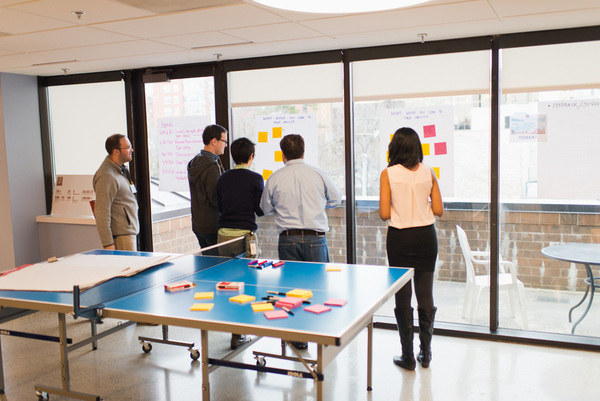 There were developers, product owners, UXers, QA engineers, a scrum master, and a project manager. There were people involved in product development and people who are not. A big benefit to the mix of backgrounds and skills was the many great experiences and perspectives that were brought to the table. The 2.5 hour event started with chatting, snacking, and name tag making. 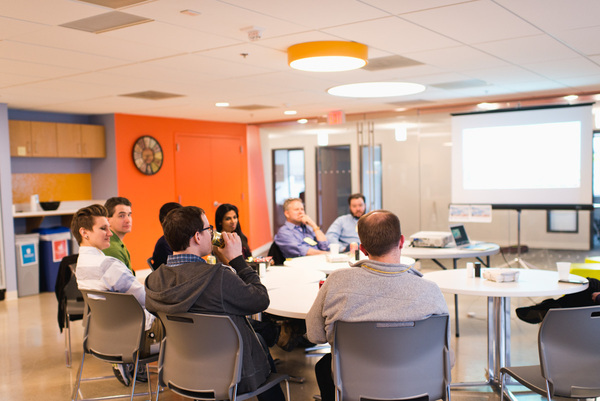 After a presentation of Balanced Team’s history and values from Beth LaPensee, we moved into open space discussions. Voting for open space topics. What are some strategies one can implement to enhance collaboration between people with different roles? What are some strategies for striking the “right” balance of skills on a team? Balanced teamers sharing their thoughts. Use tools/techniques with your team that get everyone engaged in discussions about goals and vision. Try impact mapping or story mapping. Be open with your team about what your personal development goals are. Developers can pair with a Product Owner, for example. This can be helpful because abstracting the technical concepts for a broader audience can also help the developer think about their work differently, more holistically. Pair to develop empathy with your team members or others at your organization. You will learn what you can do to make things better for them. Pairing can also be good for skills development, whether you want a deep dive into a known area or get an introduction to something new. And there were some leftover topics that we didn’t get to. There are surely some great discussions in here, so we’ll hold on to these for next time. Balanced team with remote members… can it work? If so, how? How can we advocate for QA having more time with UX team in hopes of better balance? How to combine lightweight discovery (UX) with TDD? Balanced “team” as an individual? I have a great idea – how do I test it out? Give developers empathy around what drives the business. Everyone is looking forward to the next BT A2 gathering! Watch the MeetUp group for future events. Thank you to ITHAKA/JSTOR for generously providing the location, snacks, and supplies! « Balanced Teams Ann Arbor Kick Off!